Jace Darkweaver: Our Shivarra demonesses are waiting at the Black Temple. It’s a gamble bringing them here… they used to be part of the Burning Legion after all. 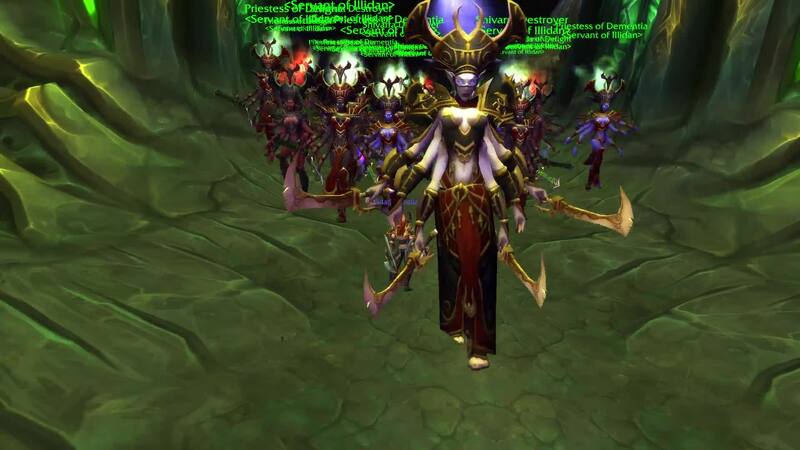 But, they are some of the most powerful in Lord Illidan’s arsenal. I have a feeling that the ultimate sacrifice is going to have to be made in order to summon them in. Feed the powerful soul into the Legion Gateway Activator and then use it to summon in your Shivarra forces. Sevis Brightflame: We have a huge problem here. The brood queen must have done something to this gateway. Not even the souls of several mo’arg were enough to unlock it. Sevis Brightflame: Your sacrifice will NOT be in vain! Lord Illidan Stormrage: Interesting. Like me, you have an immortal demon soul. You cannot truly die. Instead, your soul will make its way to the Twisting Nether. There, you will wait until you can find a suitable body to inhabit. Now get back into your corpse while there is still time and bring me the keystone. 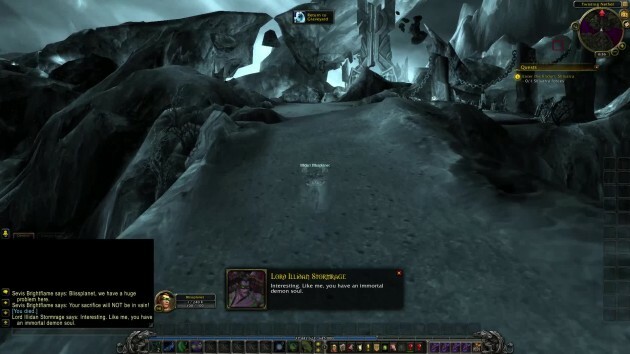 Note: Click the Legion Gateway Activator hovering on the left side of the gateway. Matron Mother Malevolence: Ah, there you are. Lord Illidan has placed my Shivarra at your disposal. A small force has infiltrated the Black Temple, but the Sha’tari army is still being repelled. We are to obtain the Sargerite Keystone with al due haste and return to aid in the defense. If you will excuse us. Come my dears. Up the volcano to the foothold. Kayn Sunfury: Mount up, (name). The Legion is not playing around. They’ve unleashed their devastators. We barely made it through. Most of us, anyway. We’re under bombardment up here, too. Brood Queen Tyranna: Are you blind? Kill them! Belath Dawnblade: (name), you made it through! Kayn Sunfury: (name), we must take the fight to the Legion here in the volcano. They must be destroyed before we fly up to the Brood Queen’s command ship, the Fel Hammer. Then, we’ll kill her, take the Sargerite Keystone, and return to the Black Temple to slay the invaders. No small feat, but I think we’ll manage. Kayn Sunfury: Grim. But demon hunters are no strangers to sacrifice. We have sacrificed everything to become what we are. The Legion will fall. We await your orders, (name).